The eyepieceless viewer enables unmatched freedom of head and body position, eliminating operator fatigue, due to an exit pupil 64x larger than traditional eyepiece microscopes. This produces a high-resolution image over a large viewing area. Mantis large viewing area promotes maximum comfort while producing razor sharp, three dimensional stereo images. Operators will no longer suffer from eye, neck or back strain commonly associated with eyepiece technologies. Safety glasses or corrective vision eyeglasses may be worn in comfort during use. Reduced Eyestrain and Operator Fatigue. Magnification Range 2x - 10x. More than 90,000 Installed Units Worldwide. Long Working Distances allows for easy inspection and manipulation. 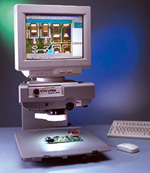 VTEK Explorer 2000 High-Resolution Magnifier is the top-of-the-line VTEK system. It features a high-resolution camera, zoom optics system and allows a choice of monitor solutions. You can even hook-up a large screen TV making it perfect for training applications. 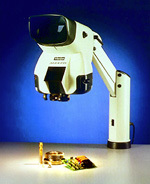 Variable Magnification - 5 to 30 times at table height. High-Resolution System - 480-line camera allows much better visual resolution than standard cameras. Dual Lighting Systems - Built-in variable intensity fluorescent ring-lamp. X-Y Movable Table - Comes standard with locking X-Y table. High Depth-of-Focus - Minimizes re-focusing. Multiple Video Outputs - S-Video, Composite (TV) and SVGA, etc. 3-sided dimmable bulb that distributes light evenly over your viewing surface without flickering or glare. Electronic slide switch reduces illumination from 100% to 25%. Provided with an ESD safe shade and Mil Std. 2000 approved lens. Ergonomically designed so you don't lose your point of reference when working.